I chose what was possibly the safest option – a mushroom burger. On a organic and vegetarian scale of a 1 to 10, I think it might have hit a 15. There was alfafa sprouts (which just reminds me of armpit hair) sticking out, the bun was made of something I almost gagged at, and suffice to say, I didn’t finish the burger. I steered clear of all things purely vegetarian after. In my mind, going vegetarian meant eating something that was bland and tasteless, and my stomach had to suffer. Three years on… no, I haven’t gone full-on vegetarian. But I’ve realised the benefits of doing so. Let’s just say a weekend of eating meat 80% of my meals – steak, pork, duck – left a bad taste in my mouth. I felt lumpy, lethargic and I knew it was doing my body harm. I was so turned off by meat that I went vegetarian for lunch the week after, thereafter including meat in my dinner. What made me push on with sticking to my meal plan was perhaps the joy I found in preparing my meals, and also knowing what I like to eat, and therefore include in my lunch. I have since cooked items like tomato eggs, mushroom silken tofu, tuna wrap (I swear by these! ), ramen etc. At this point, I’m still trying to find a balance and search for ways to get protein. One good thing that’s come out of it – my complexion has gotten better, but on the flipside, I’m always hungry and may tend to snack more. 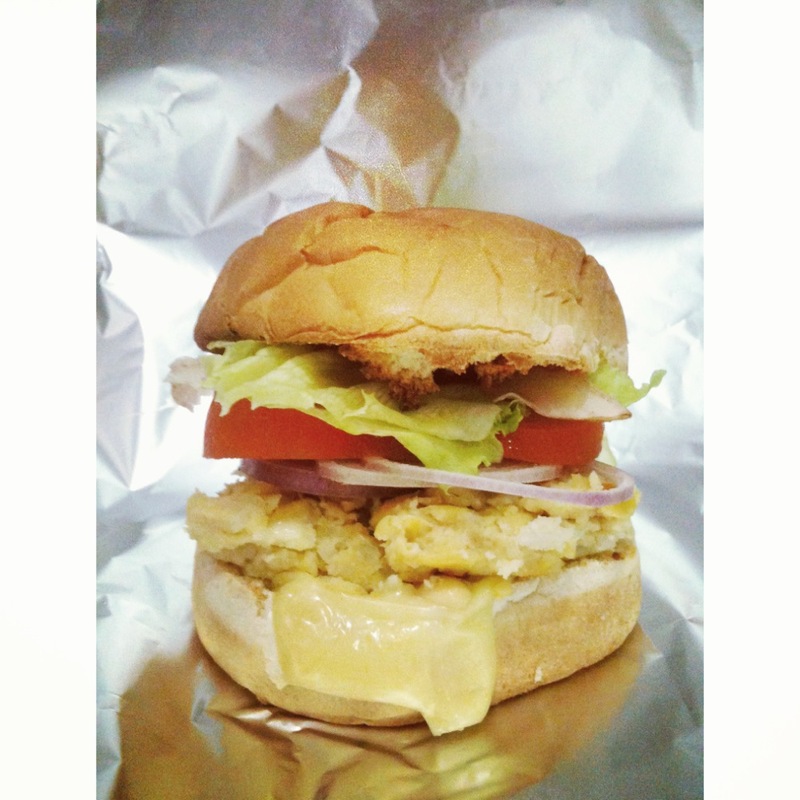 Weeks ago, my mom and I made a trip to VeganBurg – we went to the one in Eunos. I was pleasantly surprised, in fact, I kept raving about how tasty the burger was and how the patty tasted exactly like meat. You have got to try the Creamy Shrooms. It might not be the healthiest since the patty is fried, but I was so inspired that I attempted to make a veggie burger of my own – recipe obtained from WikiHow, the simplest recipe I could find. To make the soy bean pulp: Soak the beans in water for a minimum of 3 hours. Boil the soaked beans for 15 minutes in a large, heavy-based saucepan. Drain the water and mash the beans in a blender until they are thoroughly combined. The soybean pulp is ready when the beans are blended into a stiff purée. Add water as needed during the blending process. Mix all the ingredients together apart from the breadcrumbs. Mix until a thick mixture forms. Shape into evenly sized patties. Roll each patty in the breadcrumbs until coated. Bake or fry the patties. If you choose to bake the patties, they will cook in an oven at 177ºC until brown. If frying, keep an eye on the patties and turn over when each side browns. Best fried over a low heat to prevent burning. The burger was a little bland – I would have mixed an egg in, or added some carrots, perhaps chopped chillis or even more spice. I had to resort to adding a little ketchup to the burger and it tasted good. This entry was posted in Instagram, Lucky Finds, One Dish Meals, Restaurants/Cafes/Bars and tagged burger, do it yourself, eat clean, eat healthy, food, go vegetarian, recipe, soy burger, soy patty, veganburg, vegetarian, vegetarian burger, veggie burger. Bookmark the permalink. In the States we have to look for organic soy because conventional is GMO. Looks yum. We pay for our health at the front end or the tail, at the checkout stand or at the doctor’s. Eventually. Not being negative against you. Just a gen’l observation. not at all, i totally get you mean. it’s easy to slip into what is the most convenient and easiest for us. i think there needs to be a greater awareness of eating healthily – sounds so simple but it’s true.